Watford striker Isaac Success has signed a new long-term contract with the club. The Nigeria international has committed himself to the Hornets for five more years in a deal which runs until 2023, the Premier League club announced on Thursday afternoon. Watford chairman and chief executive Scott Duxbury said on the club’s website: ‘This is a just reward for Isaac’s continued hard work and application this season. 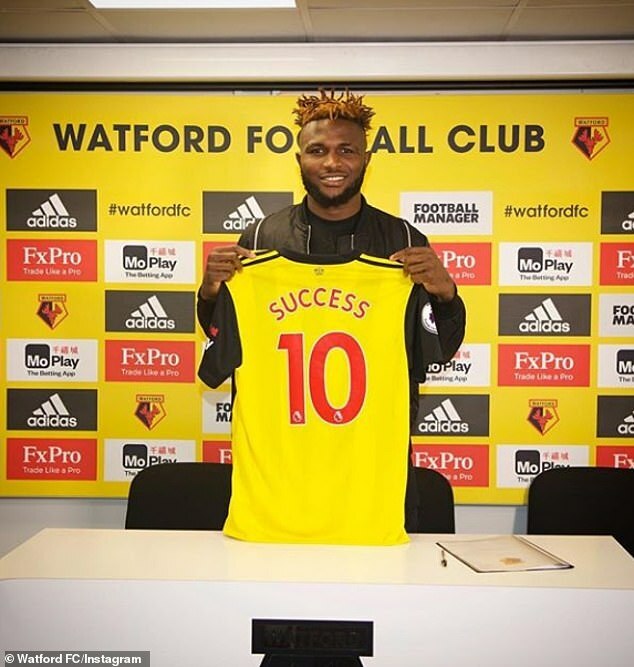 Success joined Watford from Granada during July 2016 for what was then a club-record fee of around £12.75million. The 22-year-old has scored three goals in six starts so far this season. The news of Success’ contract extension follows on from manager Javi Gracia signing a new four-and-a-half-year deal. Watford are ninth in the Premier League table and will look to respond from last weekend’s 3-0 defeat at Liverpool when they travel to Leicester on Saturday.